Flavor Text: Its tendrils wove in complicated and precise patterns... dancing with the instruments that flayed, sliced, and dismembered. Danigral - 4 out of 5. This could be a great card for a different style of Yog deck other than control (if you really want to do that). It’s a great early character that can take on a lot of other weenies. The downside is obvious: you have to keep him ready for your turn and your opponent’s turn to be able to commit him. In this case, the early efficient character is worth the potential loss of tempo as your opponent ramps up. Broncos - 4 out of 5. The good is obvious but the downside does worry me about playing him. You have to ready this guy every time on your turn for arcane struggle or else he will bounce on your opponents turn. I think the downside is significant for him to not to be an auto include in many Yog decks. But, a deck wanting to constantly plague stone or similar effects where you can benefit from your character bouncing he will be a all star. Obtuse - 5 out of 5. Big icon economy for a turn one price. Investigation in a mythos faction. Slight drawback. If you like Yog, you would have had nothing to complain about if their two additions in this box were garbage as your faction has been sitting pretty for some time. But you got a cheap early brawler with a stellar set of icons. Now you just have to decide between playing this or Faceless Abductor turn one. Somehow I don’t feel sorry for you. livingend - 5 out of 5. First the faction with the most efficient and versatile removal, now the faction with the best icon distribution across all of CoC. Yog is clinging to its title as self-proclaimed king of all factions with the inofficial agenda “We can do everything you do. But better.” It’s important to note that the drawback appears way more severe at first glance than it actually is. If anyone skips his story phase, the forced response won’t trigger. 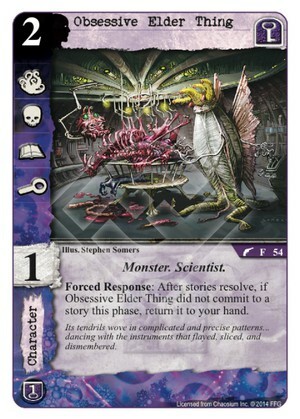 And if your opponent tries to be cheeky and drops a Robb Alexander or Dreamlands Fanatic after an unfavorable story phase… well, you know the appropriate response. Verdict: You play it, you love it. WWDrakey & Ire - 5 out of 5. Let’s face it, that’s one hell of a stat-line to see on a 2-cost character. And with some decks, the returning to hand is more of a nice option, than a drawback. And even when he gets On the Lam’d or exhausted, you can just skip committing yourself, and force your opponent to push for stories if they want to see him get bounced. Yog is already good at doing tempo due to Twilight Gate shenanigans, and this just helps feed those decks even more. If I have taken control of an opponent's Obsessive Elder Thing with Stygian Eye , and I do not commit OET to a story, after stories resolve what happens? I can't return OET to my hand so does it stay in play under my control? I guess so, but I'm not sure. From the FAQ: "Out of play is the Draw Deck, Hand, Domains (and resources), and Discard Pile, and any cards removed from the game. If a card would go to an out-of-play zone, it goes to its owner’s out-of-play zone. A card that moves from an in-play zone to an out-of-play zone to an in-play zone or from an out-of-play zone to another out-of-play zone is treated as though it were a new card." Given this, I would tend to believe that when its Forced effect triggers, it leaves play and goes to it's owner hand, regardless of who the current controlelr is. Yes, OET's Forced Responce has as many Pros as Cons I think. This card strikes me as overpowered for the cost. For 1 less cost, you get a non-unique Wilbur Whateley 1.0 with a penalty. Pretty nice, but OP compared to Anarchist, Triggerman, or Undercover Security? None of those guys have significant penalties, so I don't think the OET is broken. Anarchist, Triggerman and Underscover Security only have two icons. I'm not convinced OET''s penalty is that severe. It is sometimes an assett.